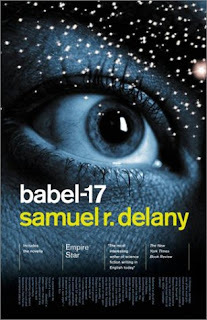 Samuel R. Delany, 1966, 173p. Rydra Wong (space-captain/poet/linguist) adventures into space in the midst of a galactic war to track down the source of a new, compelling language. This is science fiction that explores linguistics, specifically the notion that language and perception are tightly coupled. What if languages were designed that allowed new ideas to be formed? What if you could design a language that wouldn't just enable certain thoughts, but would indeed require these thoughts? Would languages that didn't include notions of independent first and second person subjects make you anti-social? Modern linguists would likely dismiss this, but people who work with software developers are forced to consider the question more seriously. Like a lot of hard science fiction from the 1960s, the science being explored has moved on. But the exploration remains interesting because there is depth to both the writing and the universe. The author's background in the humanities means that there are credible cultures and variations in species and location, credible challenges with languages. On the downside, the background is a bit more rich than the author can sustain, and some of the business around the discorporate beings is frankly silly and offhand. Overall, fresh, interesting and worthwhile short novel that has aged surprisingly well for something that has had the science move on underneath it. The edition I have was published back-to-back with Empire Star, another short novel by Delany at the same time. My wife and I both read that story on our 2009 spring migratory bird trip in the back of our camper. My wife reviewed that novel at the time. The two works are quite different, both in style and in universe, but they do connect, in that Empire Star is mentioned as a story written by Rydra Wong in Babel-17.